Today’s adventure was a local one as we headed over the bridge to the Dia De Los Muertos Festival in the Fruitvale neighborhood of Oakland. 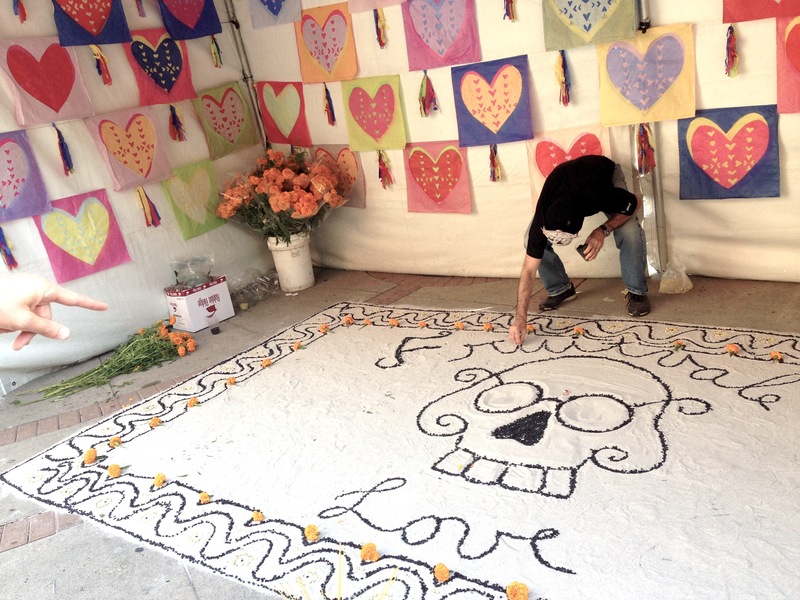 At the risk of making myself look shallow, I will admit that I am one of those fans of Dia De Los Muertos that loves it mostly for aesthetic reasons. I love the colors, the elaborate skeleton face paint, the look of the alters, the sugar skulls, the witty paper mache dolls, and the bright paper banners. It’s pure beauty. But maybe because I am getting older, or maybe it’s the mother in me, I find myself increasingly enamored with the sentiment of it all. The idea that for a few nights a year, our deceased loved ones visit us and that we welcome them with alters in their honor, dripping in celebration rather than sadness, to enjoy a visit together. It’s a lovely idea. It gets better… on Nov 2, the celebration is taken to the cemetery where families hang out with their returning loved ones cleaning their tombs, eating, drinking, playing cards and watching TV all night before sending them off with a song and returning home themselves saturated with love, community, memories and, well… some booze. 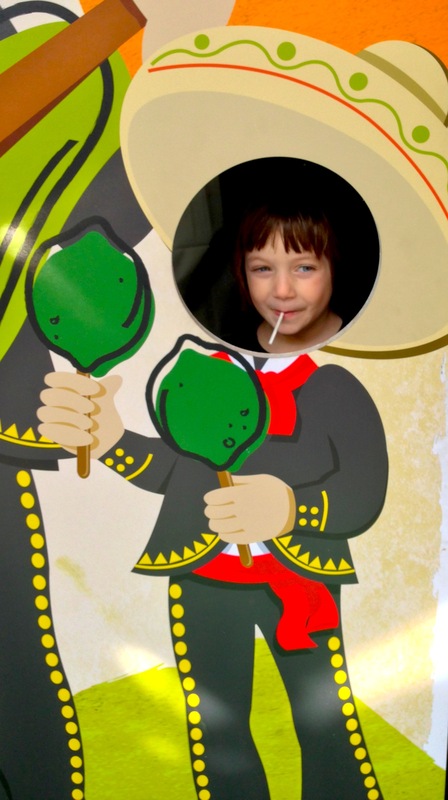 The kids running this booth were amazing. They were so proud of their art work, and for good reason. 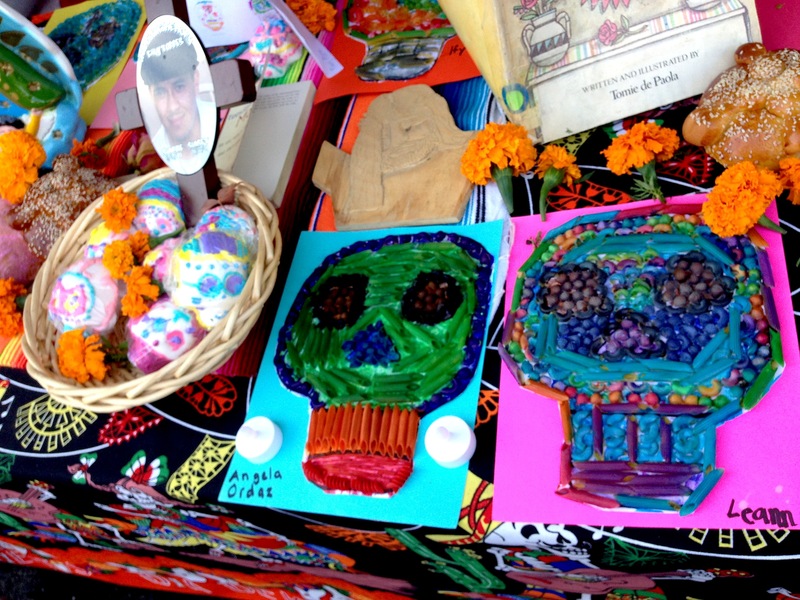 I love the idea of using pans as the canvas for these calaveras paintings. 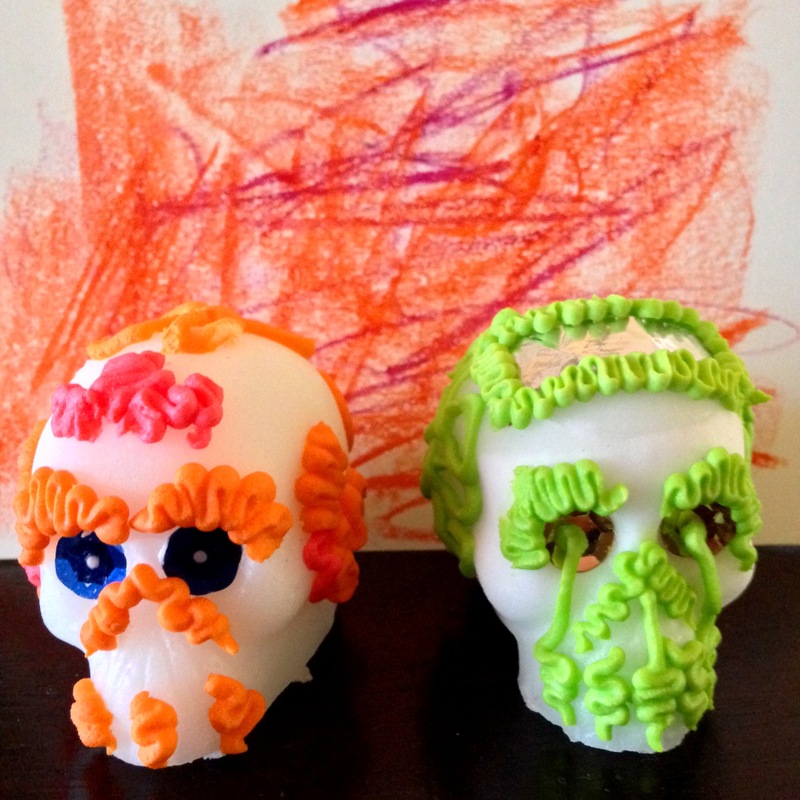 The St Jarlath School kids made these amazing sugar skulls and pasta pictures as well. Never misses a photo op. 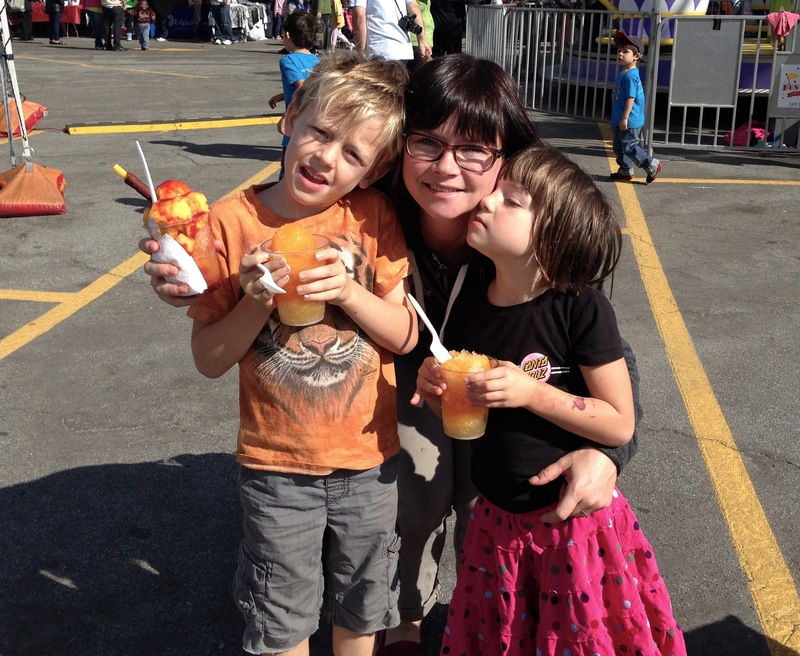 Love and Mango… and a rad tiger shirt. Mangonada! 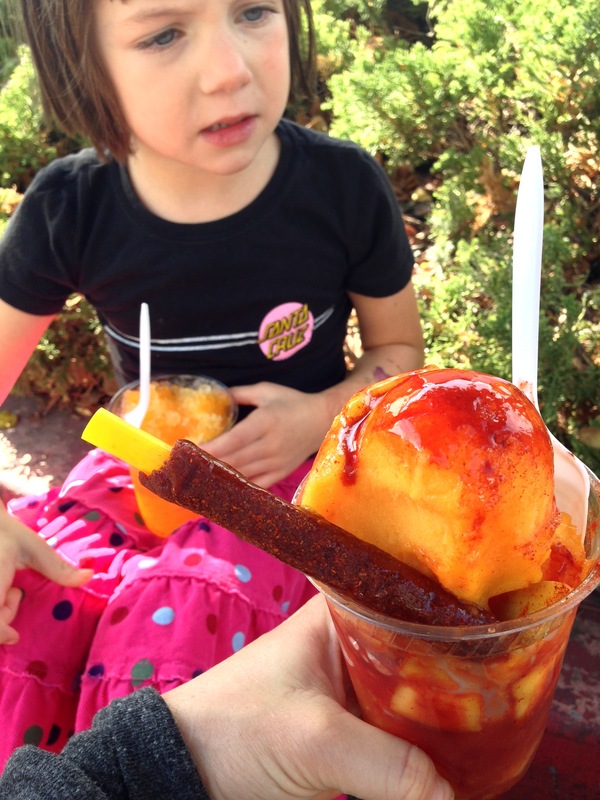 Mango, Ice, Chamoy… spicy and yum. On the way home we talked about the holiday in more detail. And it got Jack thinking about Kitty, our cat who passed away a little less than a year ago. Jack still misses Kitty a lot. 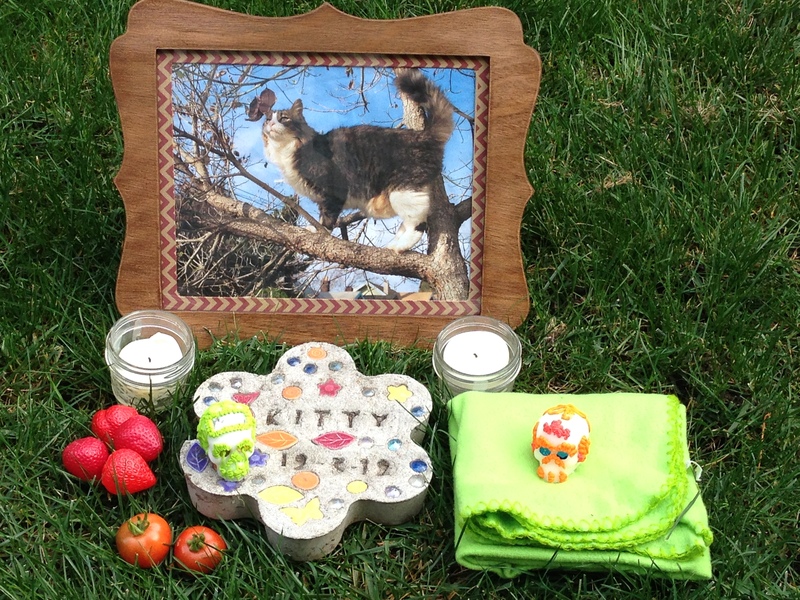 So we decided to celebrate Kitty on this Dia De Los Muertos with an alter built on the backyard grass where kitty loved to stretch out on a sunny day. We pulled together some of his favorite things: some tomatoes & strawberries, comfy blanket, the memorial stone we made when he died, some candles, and our new sugar skulls. Jack carefully placed each of these items on the grass and then we sat and talked about kitty for a few. There were some tears, but we also laughed at how kitty loved to steal and eat our fruit, and what a fun and sweet cat he was and how when he ran his saggy tummy swayed back and forth. 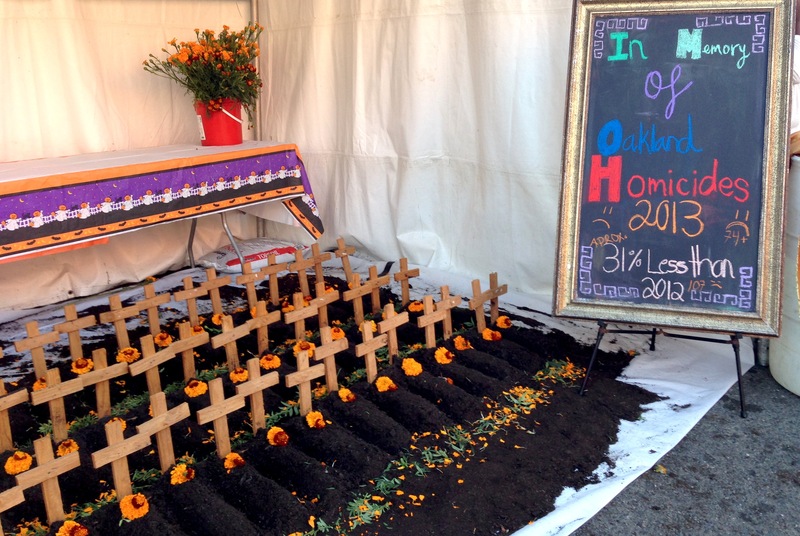 Short but sweet, our Dia De Los Muertos memorial ended in laughs and good thoughts. Kitty Alter – yes, he really did love fruit. 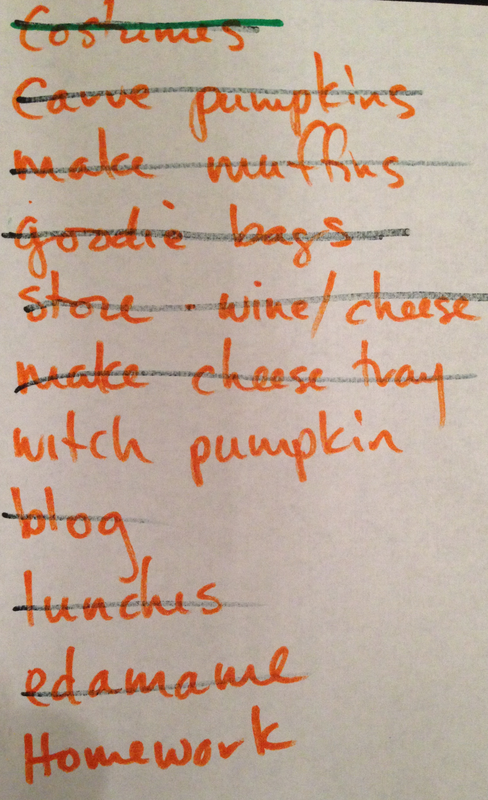 And now it’s 11:30, I’ve already crossed off “blog” so I guess I should finish it. And most everything else got done in some rushed, half-assed way. Except, as you can see, homework. That didn’t get done at all. Way to fumble on the important stuff! Cut Halloween shapes out of the slices of cheese with the cookie cutters. Layer on a Halloween tray with some crackers. done. Oh, save the scraps for homemade mac ‘n cheese. 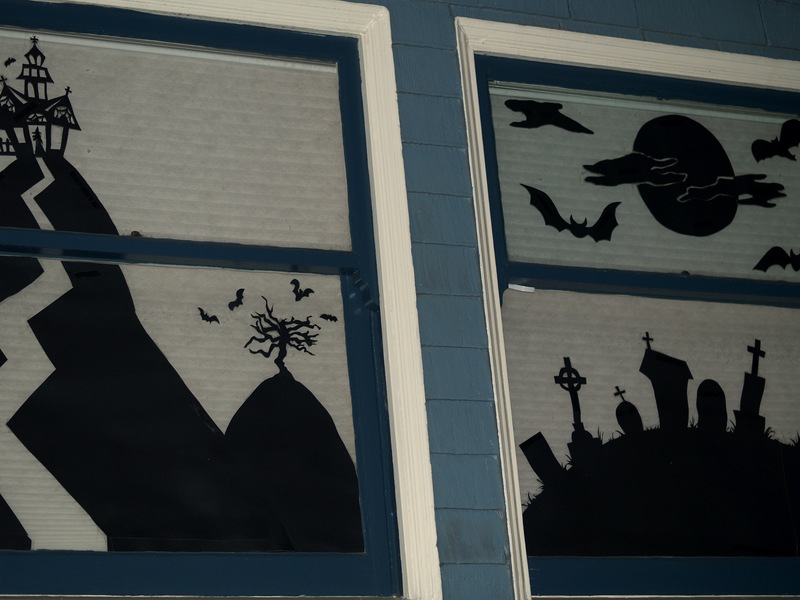 Every year I get really into making silhouette cutouts for the windows. 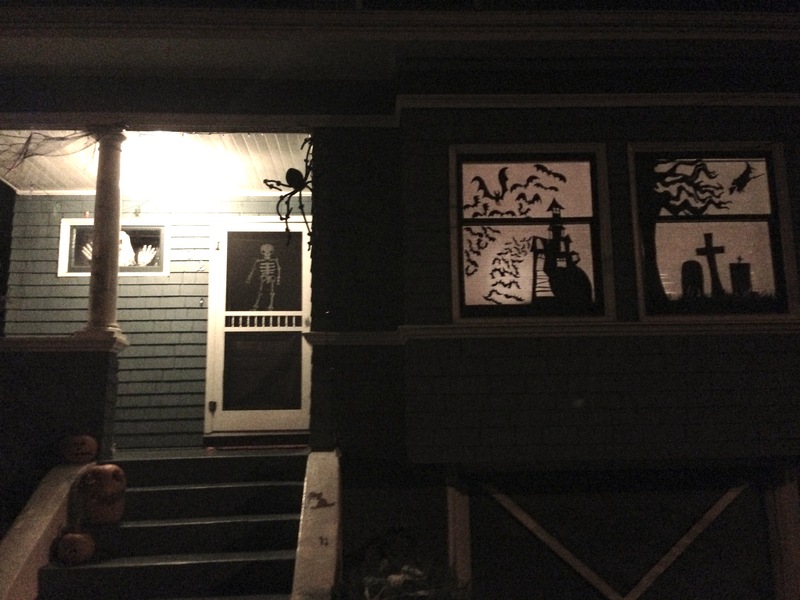 On our dinky little craftsman we have two front windows that beg for something Halloween-y. And so I buy some black poster board paper, bust out my clear packing tape and scissors, and get to work. 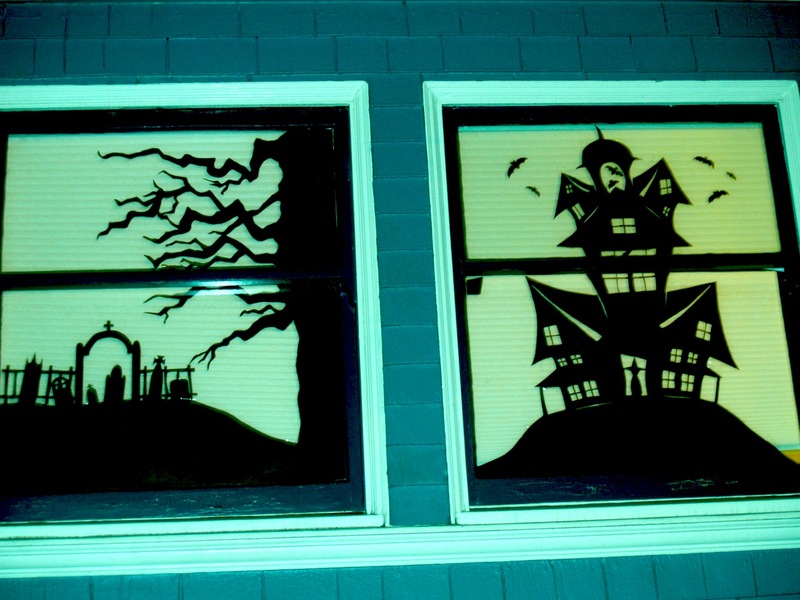 A simple Google search for Halloween Silhouettes generates a ton of ideas and usually gets me inspired. I then decide what I want to do, draw it out with pencil on the poster board, and start cutting. Scissors work well for most of the cutting, in fact you can do it all this way, but an X-Acto knife for the cutouts and fine details does give a cleaner look. Once complete, I tape them up with the clearest packing tape I can find. This way the tape on the window doesn’t show as much. I don’t think the photography does these justice, they look much better lit up in person. 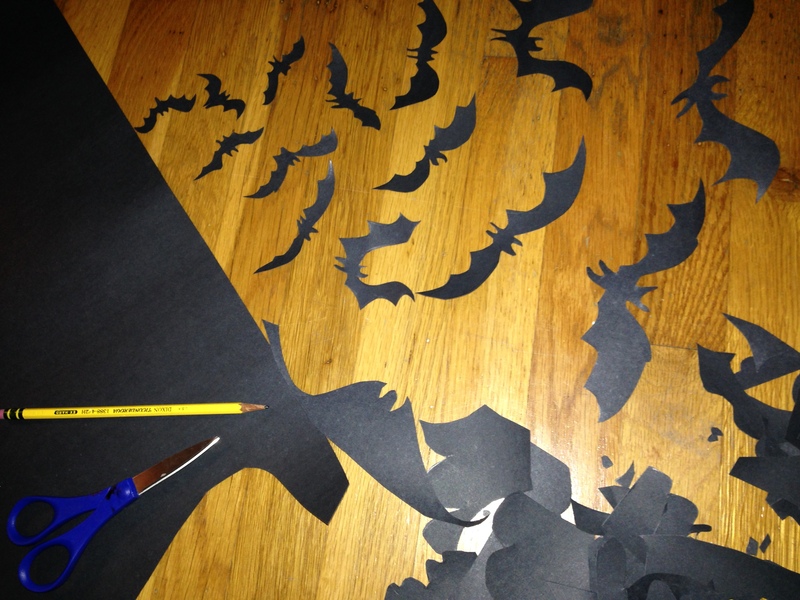 I love this project because it’s totally free-form, it’s paper art which I love, and it can be as simple as a few bats and gravestones, or as complicated as entire spooky scenes. Remember Halloween when you were a kid? How good was Halloween. 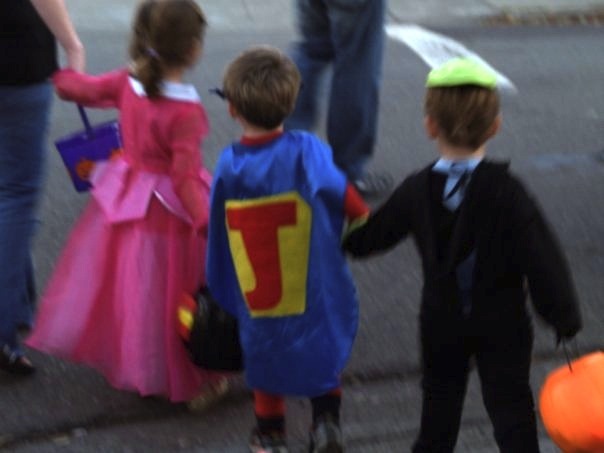 Throwing together some funky diy costume, grabbing a pillowcase for your candy haul, running around with the neighborhood crew until well after dark… adult-free. Then coming home, dumping out your candy piles, trading with your brother while your mom checked for rumored razors. Good times. I loved it. LOVED it. I was feeling nostalgic about it today while at our school’s Fall Halloween Carnival. I mean, while we live mere miles from a major metropolis, Halloween is still much the same all these years later. 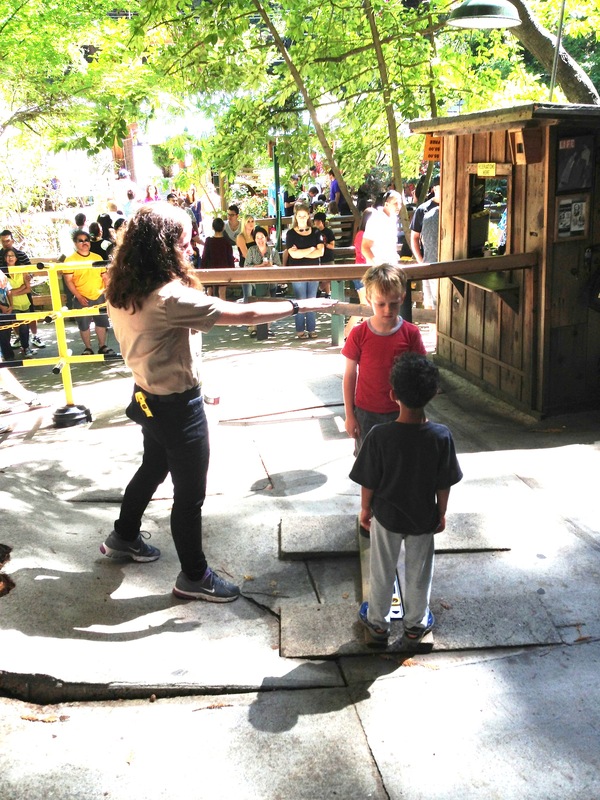 Old-school style carnivals, pumpkin patches, trick or treating, candy… it’s still going strong. 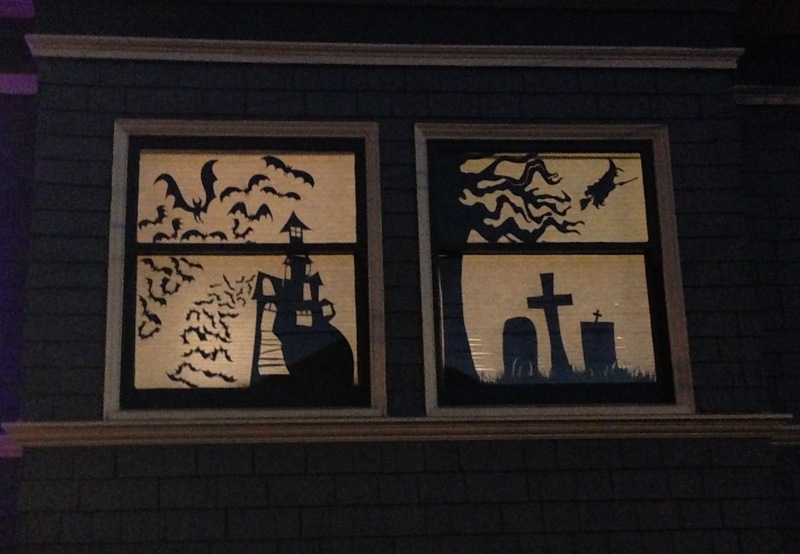 Halloween is also obviously a really perfect holiday for making stuff. This week I’ll try to post some of our favorites, starting with stuff we’ve made in the past. Ok, this isn’t from the past, this is from today. My daughter and I made it for the carnival cake walk. We totally cut corners because she’s four and I work full time. 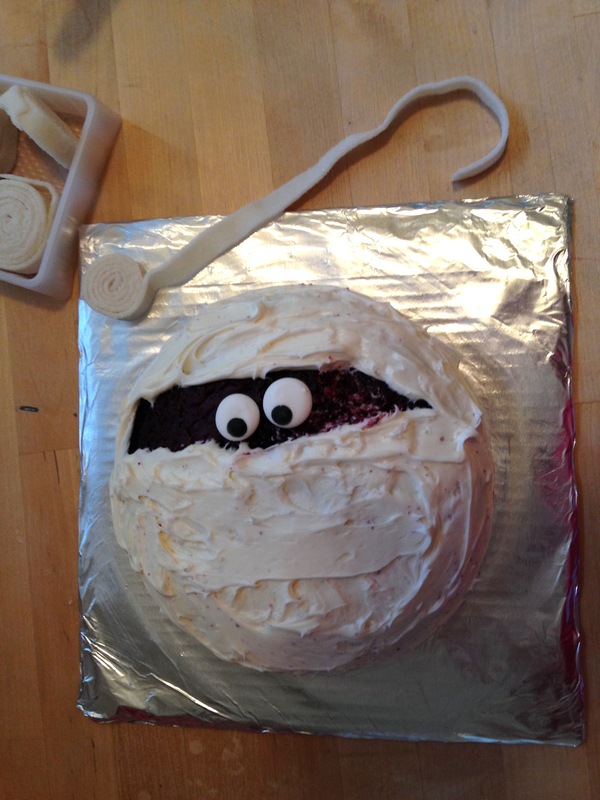 So I got a box of Red Velvet (mwahaha, blood) Cake mix, a jar of vanilla frosting, and was all set to bust out some mummy wraps with a piping bag when I stumbled upon a mummy cupcake kit at Target. White sour gummy strips! Like striking gold. All we did was cut a top of a cardboard box and wrap it in foil for the tray. We then baked the cake in a 7″ Corningware dish so that it would be tall. 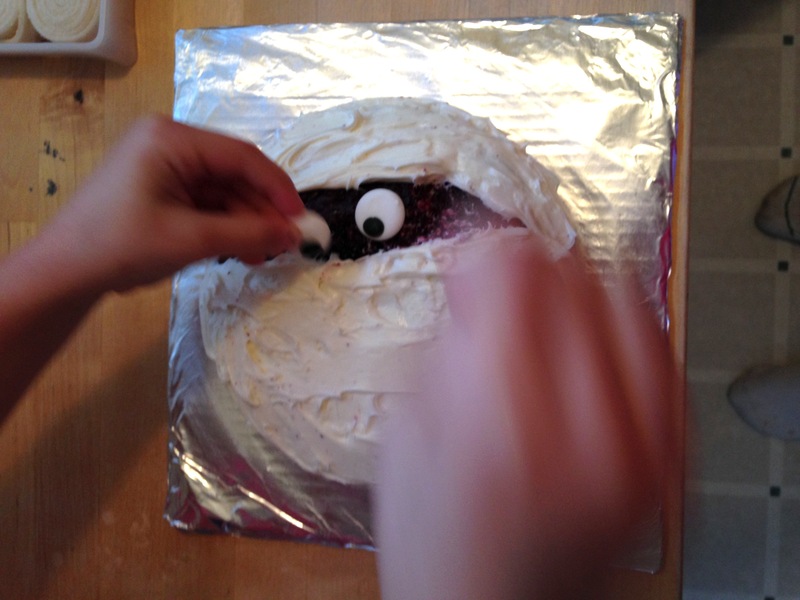 Then frosted it with the white frosting, leaving the eye area bare. 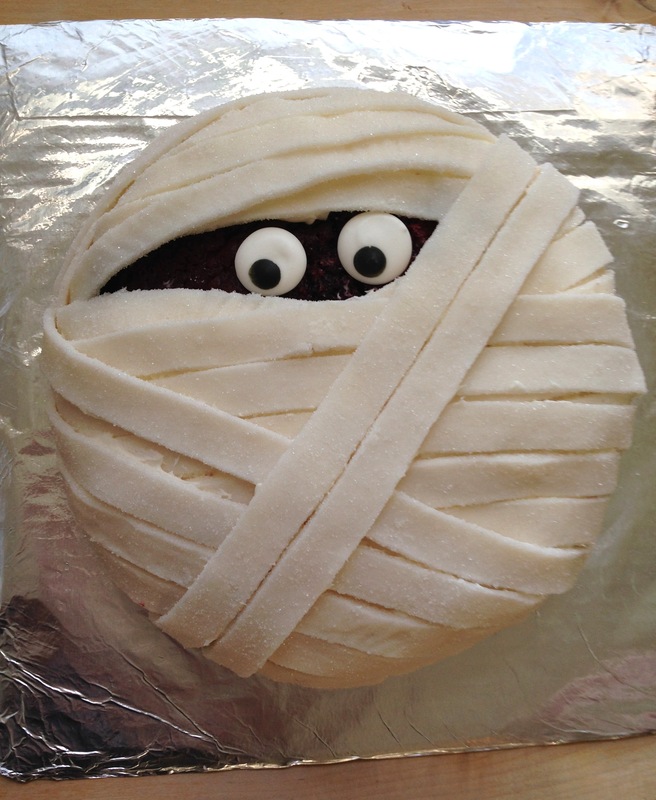 My daughter plopped some sugar eyes on, and we wrapped it like a mummy with those gummy strips. So easy. 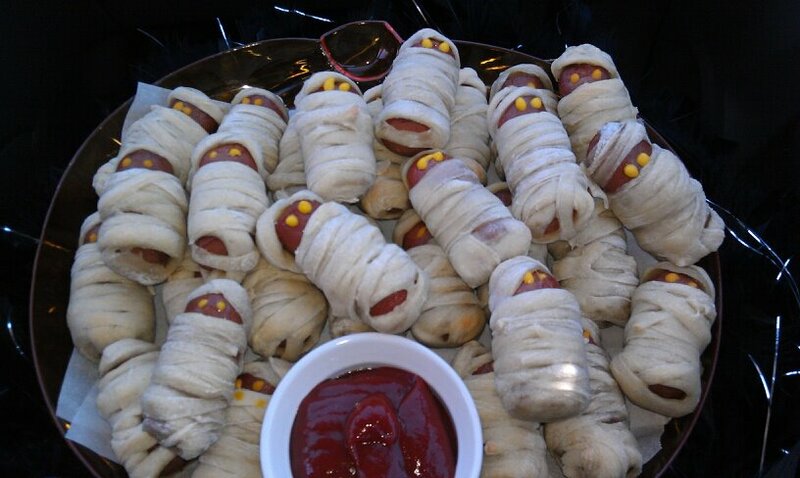 These are so easy and kinda rad so I make them every year. Use full hotdogs, or cut them in half, or get lil smokies, they all work. I’ve wrapped them in strips of Trader Joe’s pizza dough and I’ve tried breadstick or other pre-made doughs. I like the look of the pizza dough best but I recommend brushing them with some melted butter before baking. So pick your dough, cut it in strips, wrap the dogs, bake at 375-ish until the dough looks done. Dot mustard or ketchup for eyes. 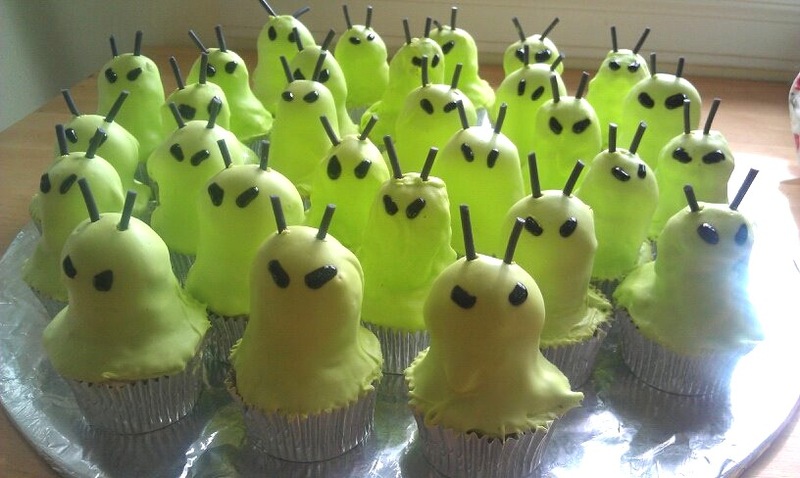 These were from the Hello Cupcakes book. They were hard. Don’t start them at 10PM. 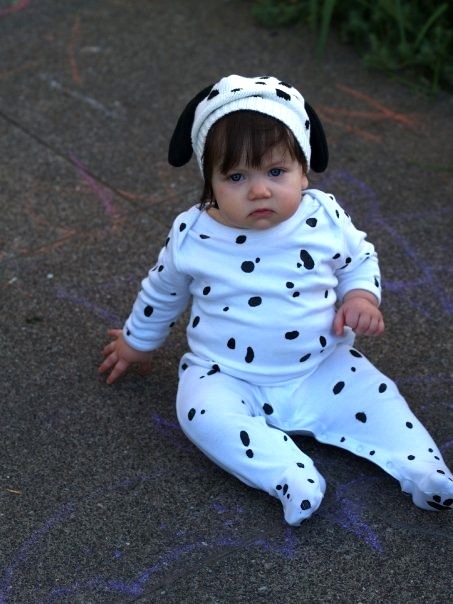 White onsie, black fabric paint… all planned around a cute hat she already had. She was a cute little Cowmation. “No party.” was his response. “Well, we don’t have to have that party” I said. Birthdaypalooza started out innocently enough back in preschool when a group of us parents with October birthday kids pulled together and threw one big bash. Brilliant! Four b-day kids, ONE party! Done. We pulled this off in various forms for four years in a row. It got so big after the first year that we had to move subsequent years to a park. It swelled to a point where last year there were 40+ kids, 40+ adults, a jumpy house, a Pirate who did magic, twisted balloons and painted faces, a pinata so big you could shove a small child in it (we went with 10lbs of candy), lots of BBQ. We had to hire a backup face painter. I loved this party. Loved prepping with the moms. Loved making the favors. 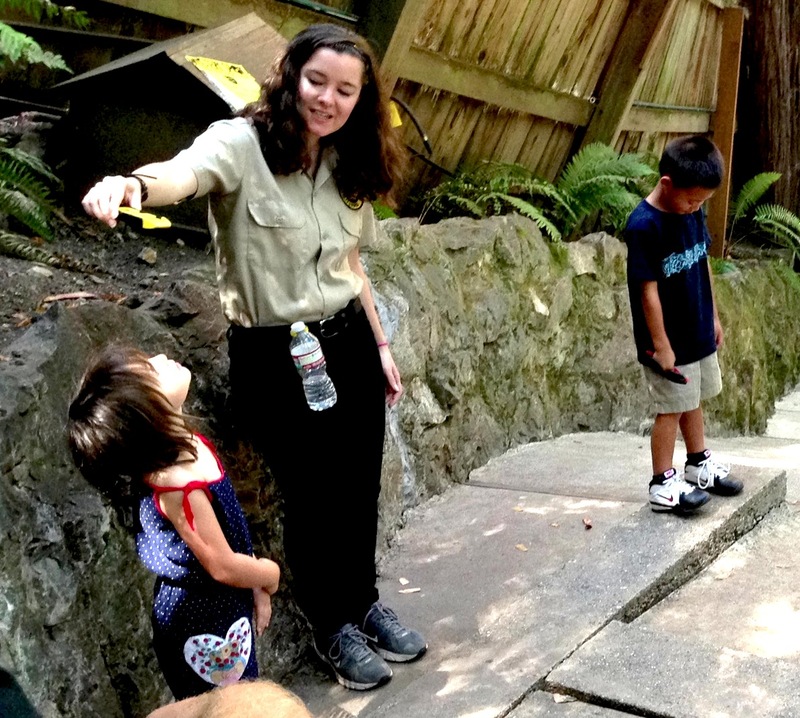 Loved watching the kids have so much fun. Loved catching up with all the parents we don’t get to see too often. But after the last one, I knew it wasn’t really Jack’s thing. Don’t get me wrong, he had a blast every year, but I knew it wasn’t the birthday party he would choose for himself. And this year he chose the opposite. NOTHING. It’s official: I scarred him for life. The answer was 1) Go with one friend to The Winchester Mystery House & 2) Have our regular neighborhood crew over for movie night + birthday cheesecake. But don’t call it a party. 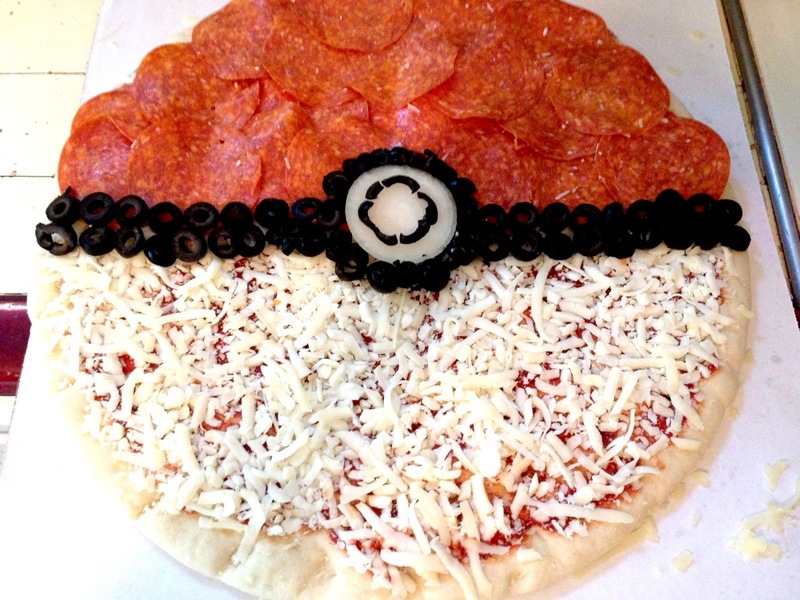 This was a super easy way to integrate some Pokemon power. I cheated a bit and bought a couple of large pepperoni take-n-bake pizzas from Costco. 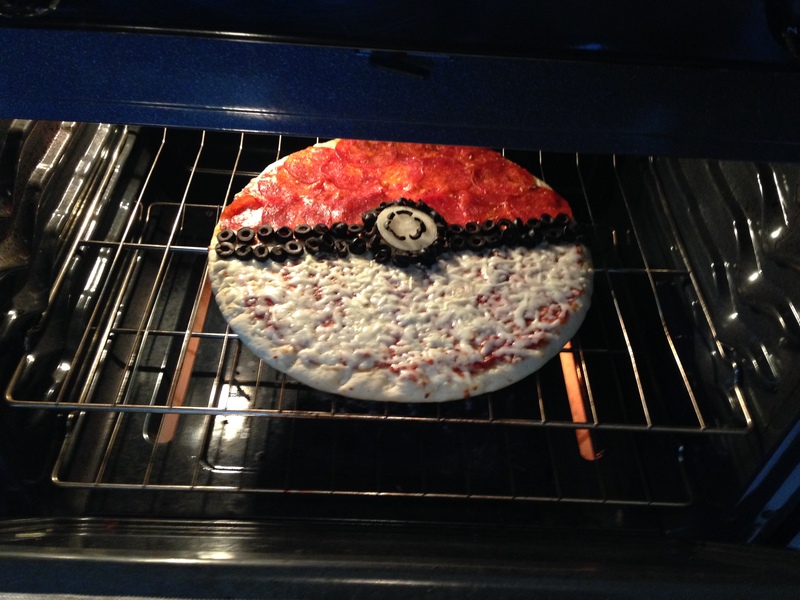 I figured the kids probably weren’t craving the grilled pizzas. I simply took off half the pepperoni, put a slice of onion in the middle of the pizza, then used olives to make the black lines. voila! 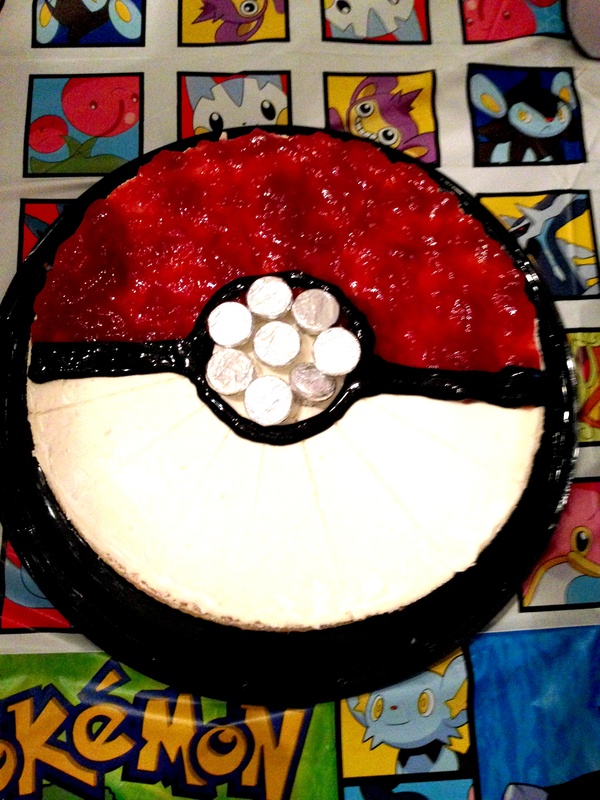 Here’s a funny thing about Jack: He doesn’t really like cheese, he doesn’t like cake… but he loves cheesecake. I was thinking about making him one and turning it into a pokeball but I wasn’t confident in getting the top super white and free of cracks, so I bought one from Costco. I then covered one half with strawberry spread, made the center button with upside down Hersey kisses, then used black cake decorating gel to finish it off. 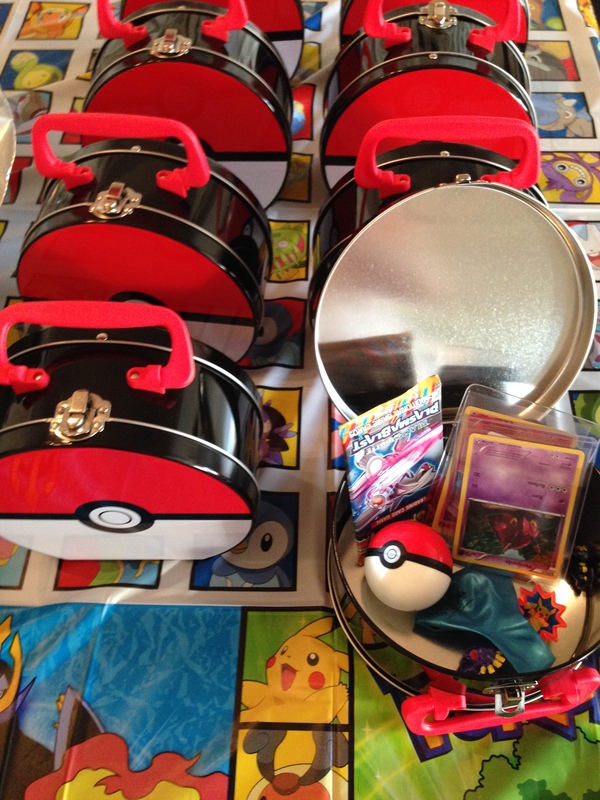 Pokemon & friends, what more does a kid need? 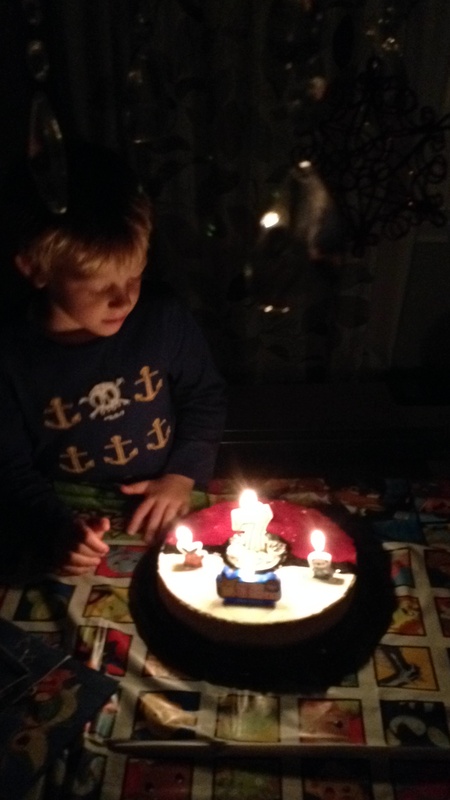 Jack had the perfect birthday. He loved it. He loved prepping his gift bags. He loved being surrounded by his neighborhood crew. 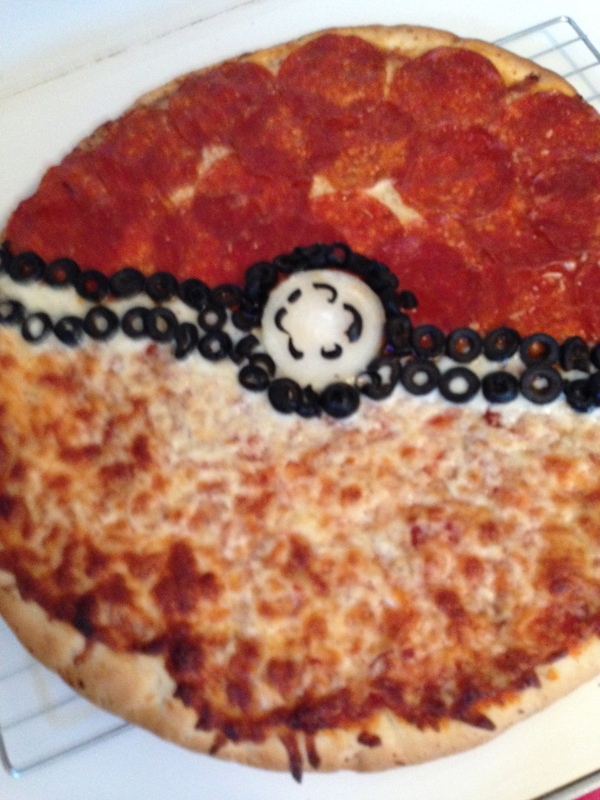 He loved the little bits of a Pokemon theme. But still… don’t call it a party. One of the downsides of having so much info at our fingertips is that there’s little mystery left in the world. Everything has been proved, disproved, researched, explained. 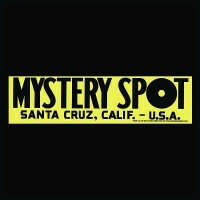 I’m semi-revolting against this as I fight the urge to google the truth about the Mystery Spot in Santa Cruz, instead choosing to live in the weirdness of the experience itself. I say “semi” because I did actually start to research the truth. Then I couldn’t handle it and closed the browser a paragraph in. I want to believe that this place is really, truly, weird. 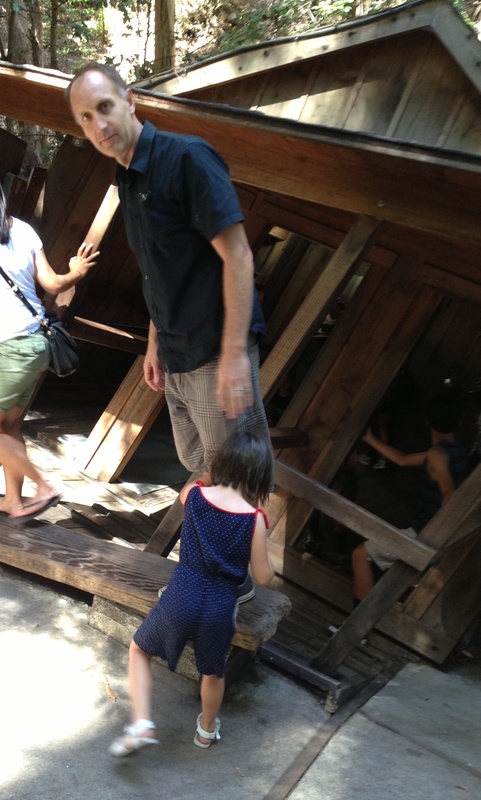 Backing up here, we went to the Mystery Spot in Santa Cruz this weekend. If you live in Northern California, you’ve seen the bumper stickers. I’ve been seeing them for years, half ignoring/half thinking it a thing of the past (supported by the fact that the stickers are typically spotted on 80’s volvo wagons). Well, turns out it’s still pumping through the tourists! So of course with the kids, the adventuring, etc… it was really only a matter of time that we end up here. And so we did, on Saturday, along with about 300 other tourists. A mystery in and of itself, where did all the people come from? We drove up the quiet mountain road, few cars in site, so how is it once we got out of the car in the parking lot, the place was CRAWLING with people?! Mysterious. 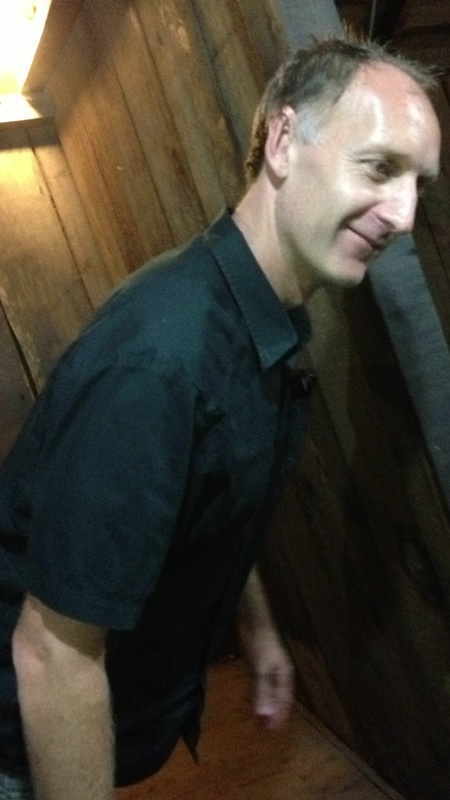 More leaning and looking a bit like a wax statue. But that’s obviously not the true point here, it’s the strange events that occur as you tour the small 150ft area in the redwoods outside of Santa Cruz. Water appears to flow uphill, people appear to shrink, grow, and lean in abnormal ways. Not to mention the dizzy, nauseous, uneasy feeling you get standing in this spot. Even my scientist husband found it all to be inexplicable and thought at the very least it would spur an interesting conversation amongst his scientist work buddies on Monday. 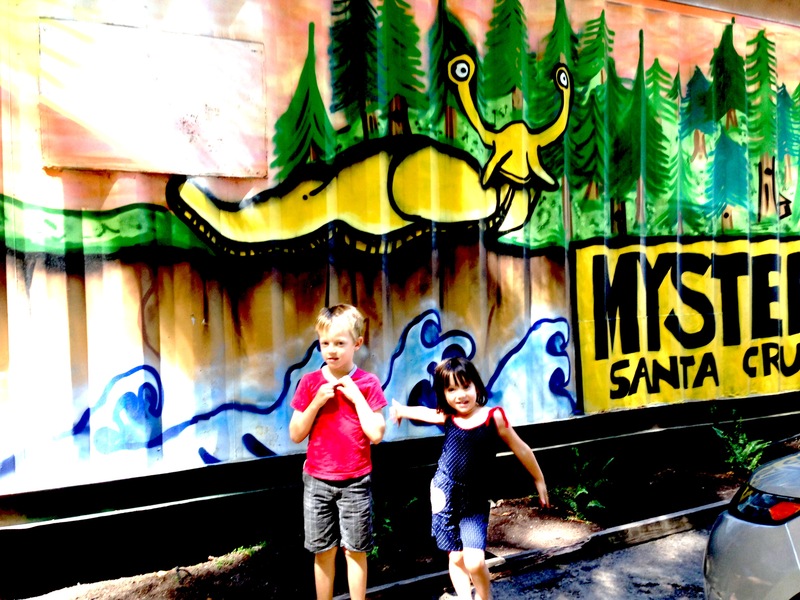 We had fun stumbling against gravity through the rooms of the tiny cabin, participating in a few puzzling demonstrations, and generally suspending our disbelief (and chuckling at some pretty cheesy jokes) for an hour in the redwoods. 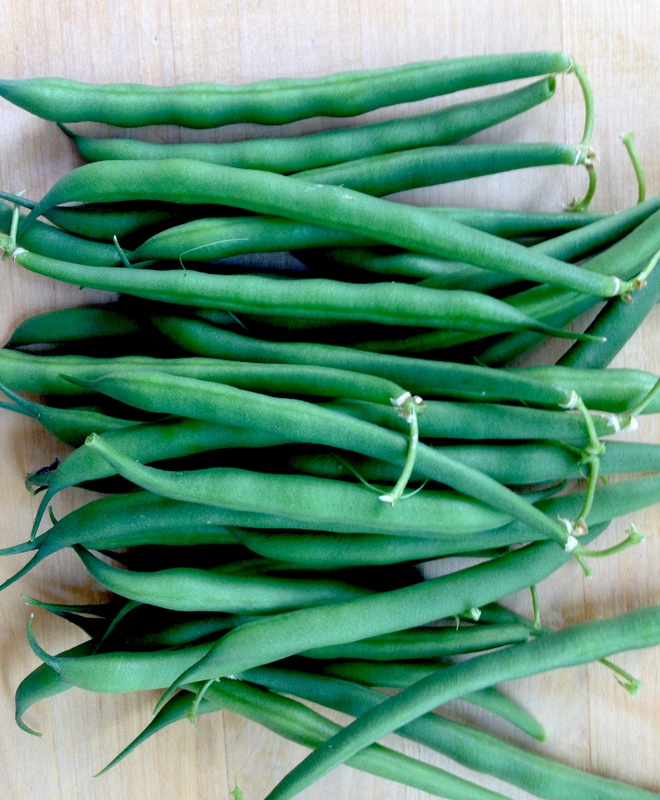 Real or not, it’s mind-bending (and cheap) enough to get our thumbs up. Summer. You’re not over yet, and yet you are kinda over. School starts tomorrow, homework too, and I even saw Christmas decor in the aisles of Costco. Which is a kinda WTF early, but, well… you’ll be missed summer. But before you totally bail on us, I thought it would be nice to hang with you a bit. Enjoy the fruits of your bounty, even if I didn’t actual grow them myself. See, we never quite made it around to the tomatoes this year. 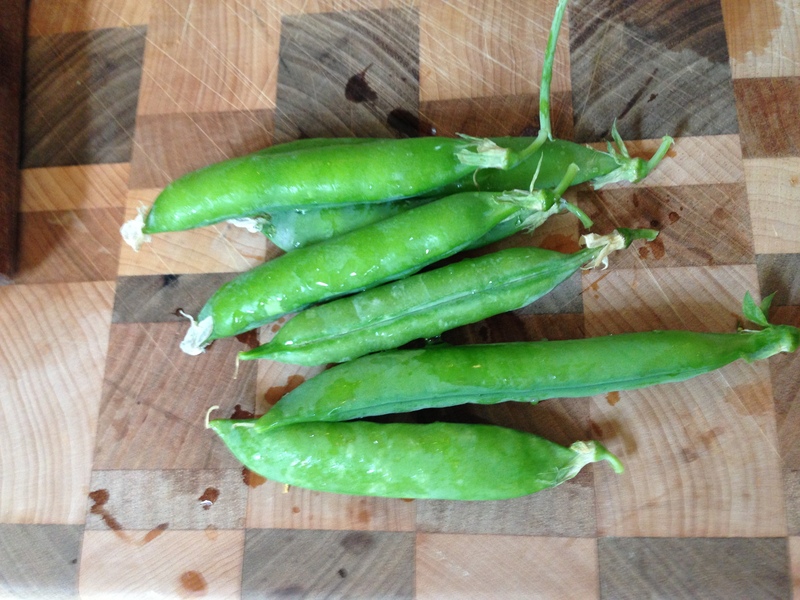 Of our micro-garden undertaking, we ended up with a handful of peas and green beans and a crap-load of plums. Though a pesky possum pretty much gnawed through most of the plums leaving sticky, smashed remnants all over our yard. So tomatoes… we were backup babysitters for our neighbor’s chickens and in addition to some fresh eggs, we also got to help ourselves to some lovely ripe tomatoes. Additionally, I had pilfered a left over loaf of bread from a work event that was too stale to eat but perfect for croutons. 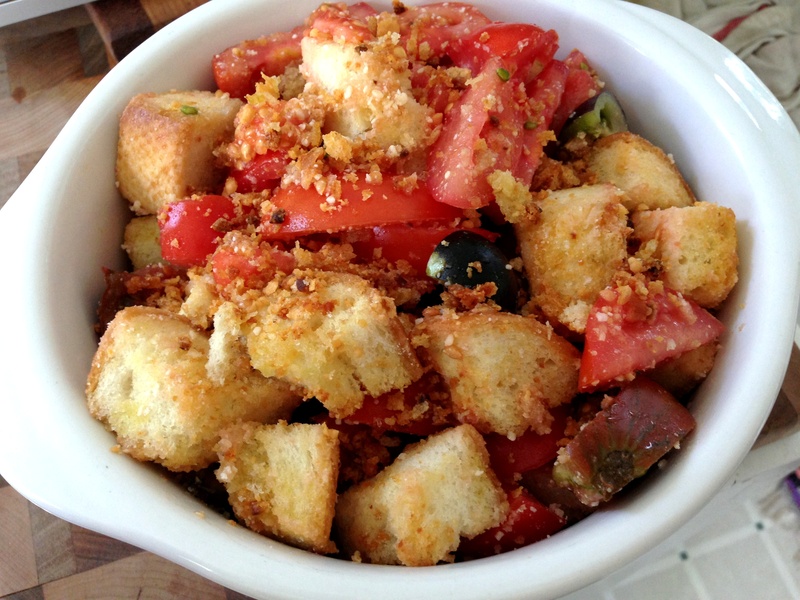 BINGO: Tomato & Bread Salad! I am not really sure how you make a traditional bread salad. I didn’t even really want to know. I just wanted to make it up as I went and see how it all came out. – Slice the bread into large cubes. 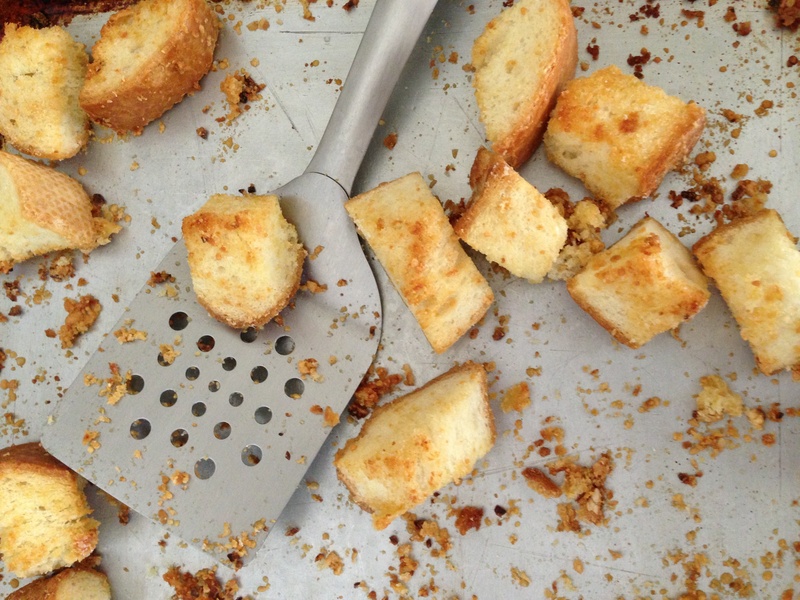 – Toss together the olive oil/garlic mix and the croutons with your hands in a large bowl. – Bake for 8ish mins, then toss them and sprinkle more parmesan and back for another 8-10 mins. They should be a golden brown. It turned out ok. Maybe a little dry. I wonder if I should have put something like a vinaigrette over it and really let it soak. Or maybe it just needed to sit longer in the tomatoes. My goal was for it to be moist but with some crunchiness. 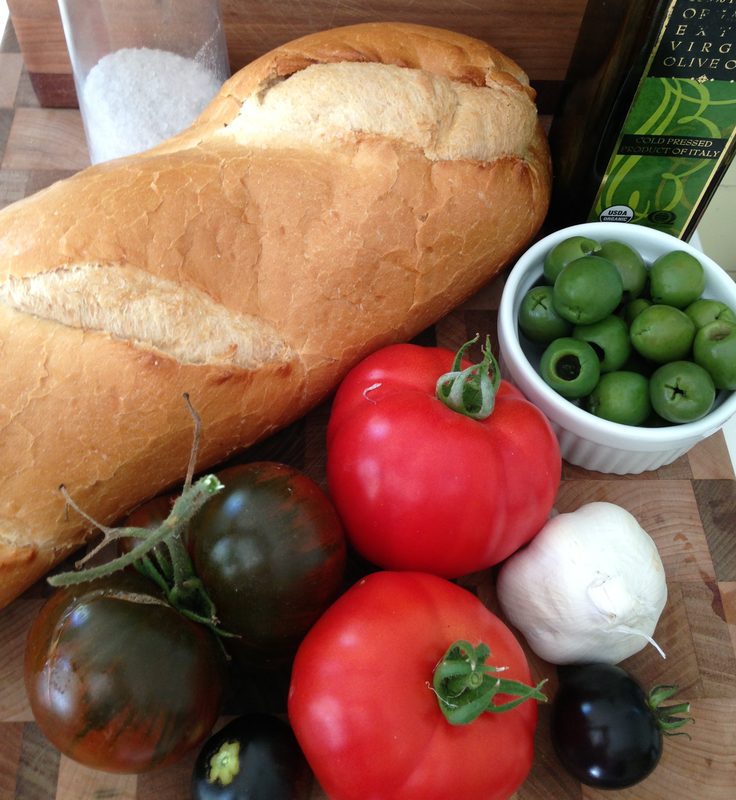 All in all though, it was a super easy summer dish that could morph with varied ingredients like fresh mozzarella, basil, various salad dressings, olives, etc. And not bad for a leftover loaf of bread and some tomatoes from the garden. 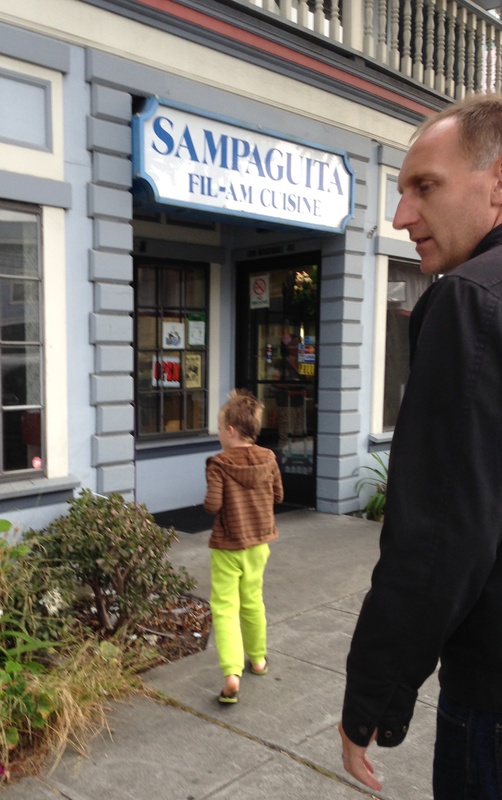 Nestled next to a laundromat on a quiet strip in the middle of the island is Sampaguita Fil-Am restaurant. I’ve been wanting to check this place out since spotting it way back. These types of unassuming, out of the way spots always intrigue me in a treasure hunt type of way. So when it got pulled from our restaurant challenge bucket I got excited by the possibilities ahead. Like this could be the hidden gem on the island! The kind of place I’ll kick myself for not having come to sooner. The underdog waiting for it’s moment. Oh boy… it kills me to say it, but it just wasn’t it. And it’s even harder to say that after we were greeted so warmly by the lovely ladies who worked there. But I just didn’t really like the food. And I kinda like most food. But not so much this time around. Sorry nice ladies! So really, what do I know. our M.O., sample a little of everything. Everything was lukewarm at its hottest. Cold Chicharones are kinda gnarly. Lots of the dishes were swimming in grease. Overall most of the dishes I tried tasted kinda bland. Jack loved the Nilagang Baka (Beef Stew in Clear Broth). In typical Jack style, he gravitated towards: beef, potatoes, rice. He gets a variation of this at most restaurants. He liked this version more than most. 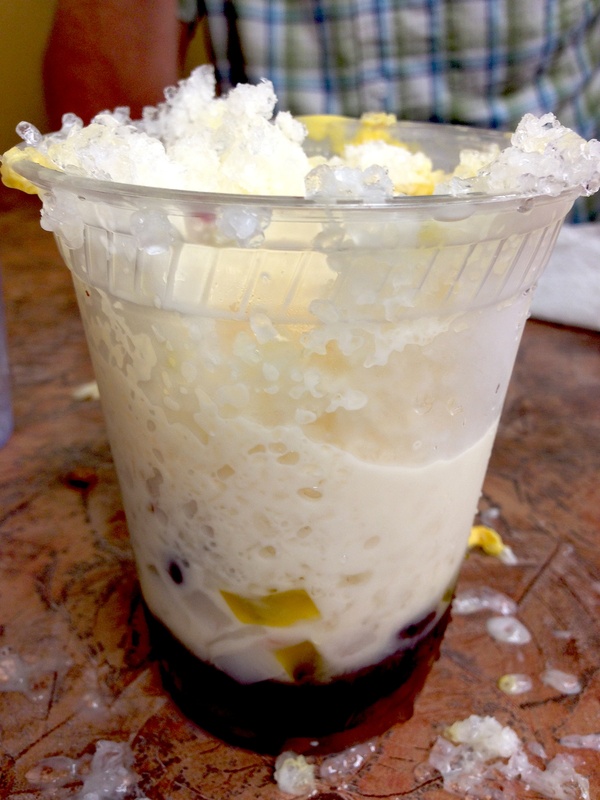 The Halo Halo dessert was also a hit. Pork Adobo and rice were her favorites. She also loved the act of eating the Halo Halo. She kept calling it fishing as she searched the dessert with her spoon for beans and pieces of coconut. Mike travels to the Philippines often and has eaten many a meal just like this. 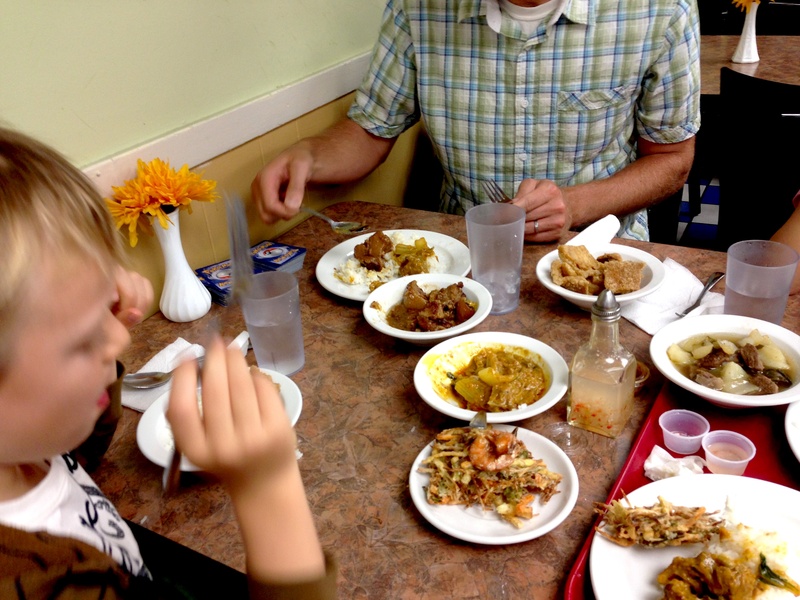 The choices, the flavors, even the small white plastic bowls used to serve the meal all felt familiar. He liked it ok, a similar feeling he has when eating in the Philippines. It’s ok. So, and please no offense to my Filipino friends, it did get me thinking why this cuisine just hasn’t taken off like other Asian foods in our area. California has one of the largest Filipino populations in the country yet you rarely see or hear of Filipino restaurants. Why is this? This isn’t the end Filipino food, I don’t give up that easily. I do want to figure you out. I’ll be seeking out answers (and further attempts) to find what I like about you.